I began following Alia Joy on social media before I knew she had authored a memoir that would resonate with my soul and help me reconnect with clarifying experiences of my past. Early in her book, Alia Joy bathes her story with fresh perspective on why we need to own our stories because they are who we’ve come to be. She says, “Words are so simple. Just letters strung together. And yet they shift heaven and earth. They explode galaxies. They have life and death contained in each strand, graced on open palms or piled like a burden. I can’t imagine living in a world where words couldn’t speak to me and rewrite my truth …” What follows are the loves, losses, and life woven into prose that is at once raw and dramatic but without a hint of ego or self-pity. Words you wish didn’t have to be written, but they are infused into her existence. Pages you don’t want to end because the hope of her experience is so vibrant. As a reader, you will discover fibers of Alia’s truth in your own life. We are all complex individuals who can identify, at least in part, with poverty, illness, abuse, racial injustice, disability, and wondering where God is in all of it —- if he is a good God. After understanding her rejections of God and crying with her through the trauma of growing up with parents whose faith rested fully on Him, I rejoiced with her when God spoke deep into her soul and Alia turned her heart toward Him. I found myself overshadowed by her despair and broken-hearted when forced changes in her home environment pushed her further into questioning the goodness of God. I cheered her on when she latched onto a glimmer of hope when she began to discover her gifts and understand her ‘Great Calling’. Alia Joy harbors no pretense. Her mask doesn’t have to come off because she starts her story unveiled and doesn’t retreat even when discussing the cyclical days of bad to worse, being judged, cynicism, and learning to trust God when people who so easily spoke of a relationship with God had anything but godly character. 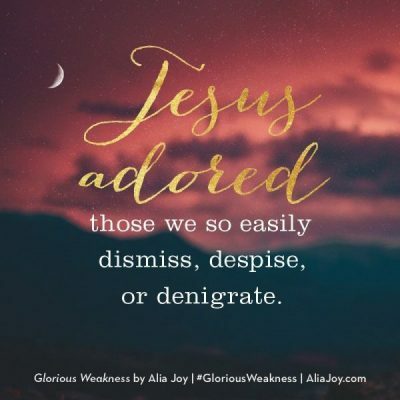 I thank God for Alia Joy’s life and am grateful that in God’s providence He chose her to write this story of grace, compassion, destiny and hope – so much hope. As she said, “As Christians, our native language is Hope.” When I learned about this book, Glorious Weakness: Discovering God in All We Lack, I knew it was one I needed to buy and read. I preordered long before it was available because I wanted to be first on the list of readers.